(short story) Someone put a rock through my hatch. I found a used hatch in the right color shipped WAY cheaper than i could get the glass replaced. Got the hatch in right before I moved so I left it wrapped so as not to damage it. Open it today and it doesn't match. I have a 91 VR4 with aero. I don't know what the hatch i recivied is. So my question is, has anyone swapped in a hatch from a different year or from an SL to a VR4? Other than patching holes and drilling new ones is there anything I need to watch out for? Here are some pics to illistrate the differences. My hatch with spoiler removed. The hatch you received is from an N/A, hence the different holes and their location. There is nothing to worry about though. Just drill the holes you need and install the A/A spoiler on the new hatch. After that, it is a direct bolt on. Good luck! 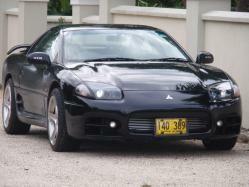 '95 Mitsubishi GTO AWD ATX - '99 front end conversion, TT conversion (15Gs), Paddle shifters, Stealth sails, A/A wing. 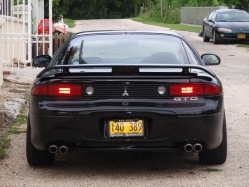 '92 Dodge Stealth ES - 3KGT body conversion. Sold! You don't have comprehesive on your car? Glass is usually covered under that, there's not usually a deductable, and it doesn't raise your rates to replace glass. If you don't have it, get it... it generally doesn't cost a lot either! Thanks! I though thats how it looked just wanted to make sure. I guess now I have some body work ahead of me. You are 100% right about needing the insureance. I have carried full coverage on it since I bought it.... With the exception of a few months when it was in storage. So of course, thats when it was attacked. Aw, crap. That's all that I leave on mine when it's off the road... comprehensive. Good luck with the hatch!! Not all states cover glass replacement. I'm fairly certain PA is one of the ones that do not. Well I managed to get the new hatch on and discovered a new problem. lol The passenger side seems to be bent up a little. Does anyone have any ideas for straightening it out? I was thinking of putting some padding on it then setting a bag of sand or something on there to ease it back into place. Any advice would be great! Here is a pick of the drivers side. Here is the bent up passenger side.